Business Travel Network: Love to Ride Momentum....Were You a Winner? Love to Ride Momentum....Were You a Winner? 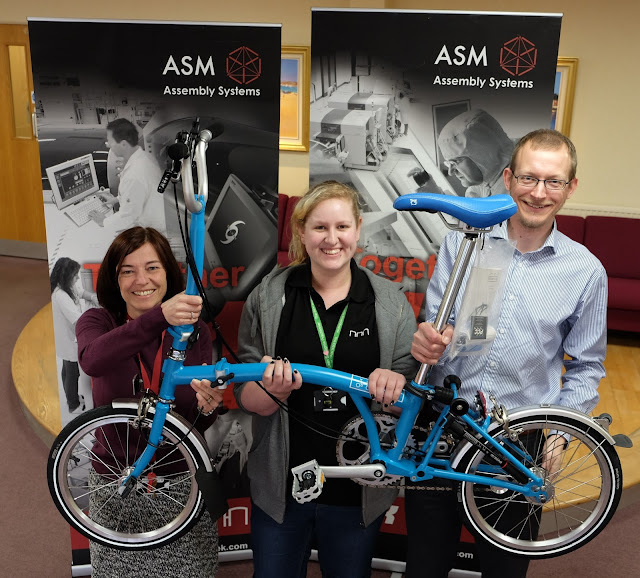 Image (l-r): Sandra Hartnell, Senior HR Manager, Kirsty Denning, Production Process Team Leader both ASM Systems Ltd, and Wayne Sayers, Sustainable Transport Manager, Dorset County Council. Did you join the other 360 people in Dorset taking part in the Love to Ride Momentum Spring Promo? Kirsty Denning did and she won a Brompton....just for riding a bike for 10 minutes! 59 organisations took part in this workplace cycling promotion across Dorset, and over 2000 rides were logged, totalling 17,293 miles! Supported by the Business Travel Network, the aim of the promo was to get people on their bikes and enjoying the benefits of cycling, and it was a great success! 12% of participants hadn’t ridden a bike in over a year! 71% of trips were made to and from the workplace. A total of 3,663kg of carbon was saved and 1.8million KJ of energy burnt over the 2 week promotion. Kirsty Denning who works at ASM Systems Ltd in Weymouth won the main prize, a Brompton, sponsored by Pedals Cycle Centre in Ferndown. 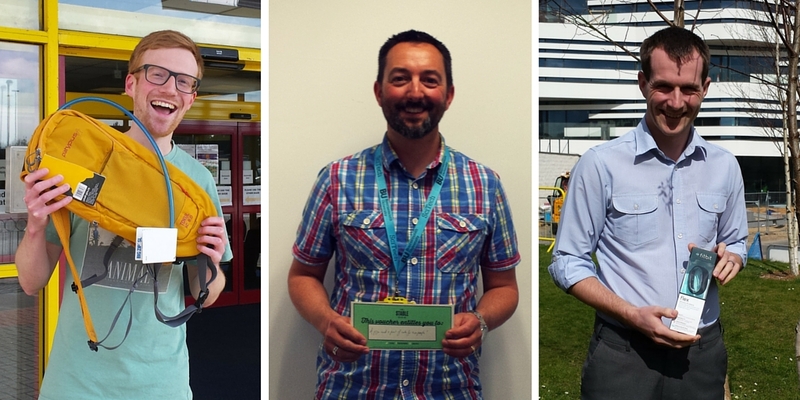 There were 40 other winners including Richard Houston form the Royal Bournemouth and Christchurch Hospitals who won a Platypus Camel Pack, Evie Prescott from the RNLI who won a FitBit Charge HR, 30 participants won a year’s Ride Membership for British Cycling, and Rachel Alcock-Hodgson from Dorset County Council who won the photo competition and receives a voucher for ‘Pizza and a Pint for 2’ at The Stable. Richard Houston (Royal Bournemouth and Christchurch Hospitals), Charlie Annear (Bournemouth University), and Simon Lincoln (Bournemouth University).